The oncologist specifies the dose for each patient individually. Occasionally carboplatin is injected directly into a body cavity rather than the bloodstream. For instance, intraperitoneal infusion may be employed for ovarian cancers, Regional administration more directly targets the drug to the principal tumor site and can achieve a higher drug concentration in the vicinity of the tumor. This is not a "labeled" use of carboplatin, but oncologists use it this way if they feel the situation warrants it. 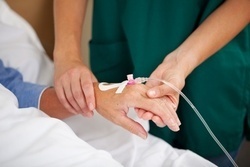 According to uptodate.com, a typical regimen for intraperitoneal infusion is 200-650 mg/m2 in 2 L of dialysis fluid. Patients should make sure they get adequate nutrition (frequent small meals may help) and adequate hydration unless instructed to restrict fluid intake. Nausea and vomiting may be severe and you might be given an antiemetic drug to control vomiting. You will be susceptible to infection; avoid crowds and places where you might contact germs. Very occasionally, people have an allergic reaction to carboplatin. The symptoms are similar to allergic reactions to other materials, and if the patient is allergic, the reactions will show up on first treatment. New patients on carboplatin are monitored for allergic reaction. And all patients are regularly monitored when on any form of chemotherapy. This monitoring include blood tests and neurologic exams to test reflexes. Some carboplatin is metabolized in the liver but mostly it passes out the kidneys unmetabolized. Carboplatin has a half-life of about 30 hours in the body. It comes out in the urine, and it is even possible to recover the platinum from the urine. Carboplatin is often used as part of a combination chemotherapy regimen It is combined with one or more other chemotherapy drugs by oncologists to increase treatment efficacy. This is kind of interesting: Chemists figured out a way to use new carbon materials - the tiny spheres of nanographene oxides (NGO) - to enclose carboplatin. This is a way to control release of this drug. By varying the size of the spheres and other material properties, the kinetics of release and position in the body of release can be influenced. where AUC (area under the curve) reflects the concentration of drug in the body that doctors want to achieve. GFR is the glomerular filtration rate at which the patient’s kidneys filter blood; A is the ratio of this glomerular filtration rate to how quickly the kidneys get rid of carboplatin; and B is a constant, reflcting the rate at which the body gets rid of carboplatin in other ways than through the kidneys. Typically carboplatin is given at a dose about 4 times that of cisplatin because of its lower effectiveness per gram. 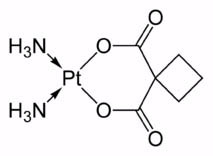 All chemotherapy drugs, even generic ones, are expensive, and platinum-based drugs have the characteristic that their production cost depends partially on the market price of the precious metal platinum. A British study in the early 1990s found that although carboplatin is more expensive than cisplatin on a per dose basis, the total treatment cost, including those in preventing and managing toxicity, are comparable if not lower for carboplatin.